Mission Spec has announced the public release of the XL version of their Ultra-light weight plate carrier. 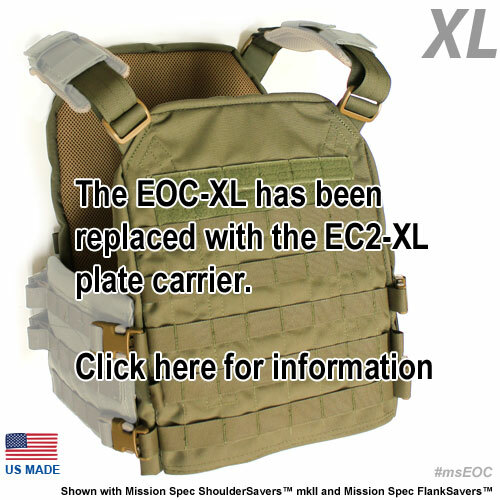 The standard version of the Essentials Only Carrier (EOC) fits Medium or Large (e,x)SAPI plates where the new XL version is designed specifically for the bigger Extra-Large armor inserts. The EOCXL™ is fully compatible with Mission Spec Shoulder Savers mkII™ and the recently released FlankSavers™ for adding side armor protection to the system. Users wanting more information are encouraged to watch the promo video for the standard (M/L) model located on the product information page. The EOCXL is available for immediate order and can be customized for end user’s (individual/unit/department) specific needs. Customers seeking customization should contact Mission Spec on the website email contact form. 100% designed, tested, and manufactured in the United States, Berry Compliant, Limited Lifetime Warranty, and available in Mission Spec’s full line of available colors and patterns.